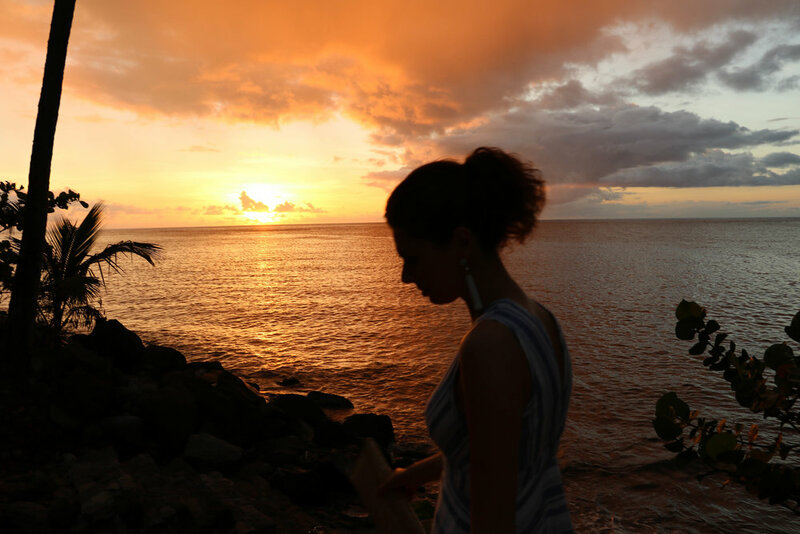 If there's one thing I know I'll never forget about St. Lucia, it's the sunsets. Nestled between the dramatic twin Pitons with incredible views of the Caribbean Sea, Sugar Beach makes for the perfect spot to watch the sun dip below the horizon. We celebrated our one year wedding anniversary with a stay at the Viceroy Resort (more about our visit here) and our days of fun in the sun ended in quiet moments of gratitude and reflection on the past year. Each night was equally spectacular, with the white sand turning gold and the sky vibrant shades of pink, purple, blue and orange. There was usually a sailboat or two anchored in the bay adding to the peaceful island vibe. We'd soak up every last bit before heading to our bungalow to get ready for dinner, and looking back, these 30 minutes or so each evening were my favorite part of the trip. Flipping through my camera roll I couldn't help but notice that a good chunk of the pictures I took were in these moments. Pictures don't near do it justice, but here are a few from our final night on the island. It was so beautiful! I'm not sure if the sunsets are always this stunning at Sugar Beach or if we just happened to hit an amazing couple of nights (I have a feeling it's the former...), but they created a phenomenal backdrop to our wonderful experience!